for your Free Confidential Consultation. Recently the federal government has brought in a program to crack down on Electronic Suppression of Sales Software sometime known as Zapper Programs. The fines and penalties for using or owing this software are up to $500,000.00 and imprisonment. 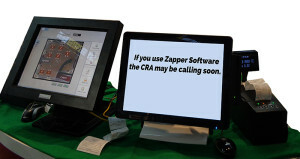 CRA has become more sophisticated at identifying business that use this software. Everything form statistical analysis to leads generated from the vendors of this software (who provide their clients names to protect themselves). CRA will catch you, it’s just a matter of time. Call now for your free confidential consultation to know what your options are before it is too late. Feel free to call us to talk about your tax related issues. Alternatively, you may fill out the form below and we will contact you.